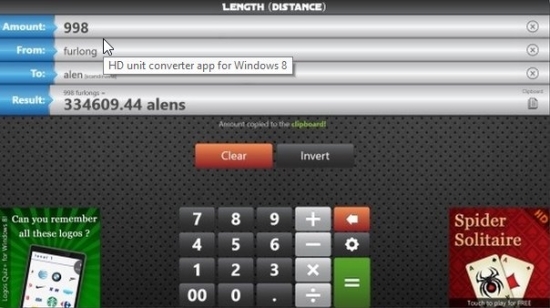 Here is a list of 4 free Windows 8 Unit Converter apps. Using these apps, you can easily convert a value from one unit of measurement to the other. These apps are very easy to use and give quick results of conversion. You can use these apps to convert a wide range of units for common measurements such as area, volume, length, weight, speed, etc. The first three Unit Conversion apps are available under Tools category of Windows Store while you will get the fourth one under Productivity category. Let’s have a quick look at each of these Unit Converter apps. 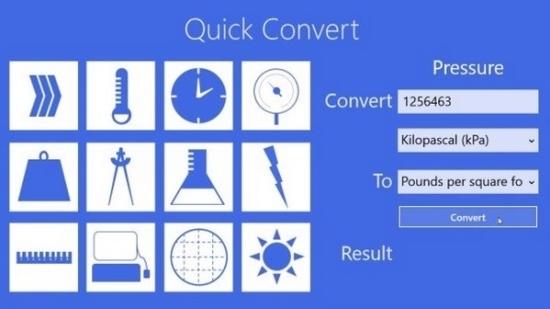 Quick Convert is a free Windows 8 Unit Converter app that helps in easy conversion of units. The app comes with 12 different unit categories that include Length, Area, Volume, Angle, Time, Velocity (speed), Temperature, Pressure, Mass, Energy/ Work, Power, and Data. Each category further shows a list of measurement units/metrics it has. Quick Convert app is very simple to use. The interface of the app looks quite interesting with icons of unit categories displayed on the app’s screen. All you need to do is to select a category, put the input value, and select measurement units/ metrics between which you want to make conversion. And the app will instantly process conversion and display result on the screen. Click here to get Quick Convert. 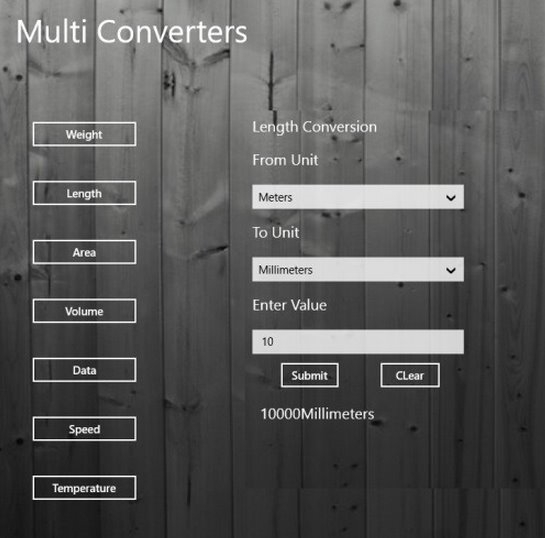 Multi Converters is a free Windows 8 Unit Converter app that offers 7 most commonly used categories for unit conversion. These categories include Length, Area, Volume, Speed, Temperature, Weight, and Data. It is a very basic Unit Converter app with a simple interface and just performs the simple task of unit conversion. You can select a category displayed on the app’s screen, select the units between which you want to convert a value using the dropdowns, and enter your input value to get the result. Click here to get Multi Converters. 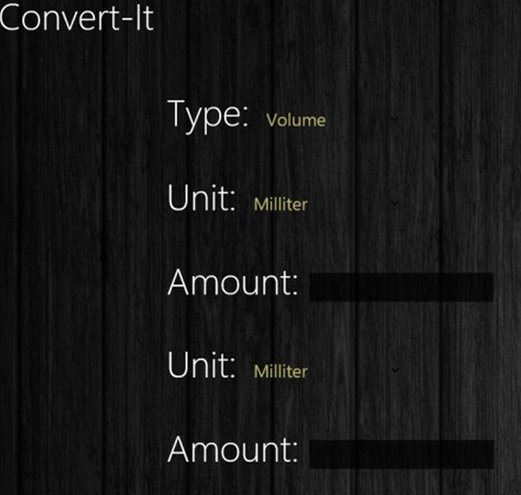 Convert-It is another Free Windows 8 Unit Converter app with a minimalistic interface. Using this app, you can make conversions from among 11 measurement units. These categories include Length, Mass, Area, Volume, Energy, Power, Time, Velocity, Temperature, Pressure, and Digital Storage. As mentioned, this app comes with a minimalistic interface, that is no list of categories is displayed on the app’s screen. Instead, all fields are to be selected using the dropdowns provided in the app. You can select the desired category, units between which you want to make conversion, and enter the value to be converted in the Amount field placed at the top. The app will instantly display the converted value in the Amount field placed at the bottom. Depending on your selection of a category, the listed options of Unit dropdowns will also change. Click here to get Convert-It. Convert Units HD is a unique Windows 8 Unit Converter app that displays additional related information along with unit conversion. This information includes formula of the specified conversion, a list of units between which you can make conversions, a calculator to enter values, etc. A special feature of ‘Invert’ the units of measurement is also available in the app. You can use calculator provided at the bottom of the screen to enter the desired value in Amount field, desired units between which you want to find conversion in To and From fields, and get the result instantly. The app also lets you copy the resulted amount to Clipboard. Click here to get Convert Units HD. These were some of the useful Unit Converter apps we have found. Try these to convert a number of units and get instant results. Share your feedback via comments.